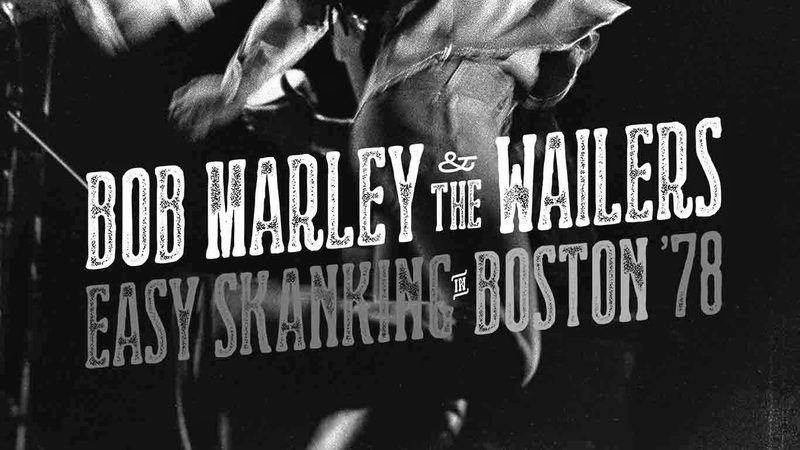 Released on Feburary 17, 2015 and kicking off a year of celebrating what would have been Bob Marley’s 70th birthday, the new archival release, Bob Marley and the Wailers Easy Skanking Boston 1978 is a welcome and long awaited addition to the Marley live discography. The new beautiful soundboard recording features the first of two performances at the 3,600 seat Boston Music Hall on June 8, 1978. These particular performances have circulated for years amongst Marley fans and scholars and with this release, the tapes have finally earned an official documentation. Recorded right in the middle of the 1978 US Kaya tour the band is practiced, smoldering, smoking and disseminating the Wailer brand of ‘Rebel Music’. As an added bonus to the featured 13 song stunning soundboard recording of the early show, an additional Blue Ray included in the CD/Blu Ray combo package spotlights 7 songs shot by an enterprising fan from the front row in surprising and inspiring clarity. 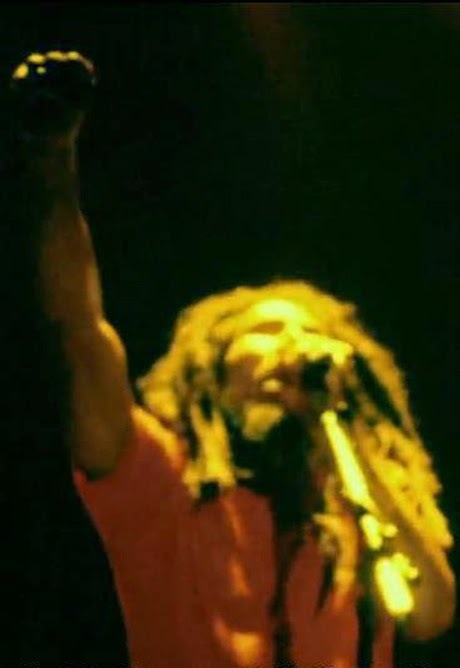 The resulting footage puts the viewer at Marley’s feet for a divine and inspiring view of the master in his element. Marley’s stage presence is mesmerizing, as every rhythmic movement and vocal nuance is channeled through him supernaturally. This bonus footage is truly a gift for any fans of Marley and offers an additional and unique glimpse into his ritualistic performing alchemy. Where the additional ‘bootleg’ video footage is missing in spots due to reel changes, the Marley family has added tasteful and trippy animations to help fill the gaps. The result is a spectacular addendum to the complete concert audio. The concert begins with a rare for the era performance of ‘Slave Driver’ that slowly opens the creaking musical door without a sound and slinks out of the humid island darkness. When Marley’s vocals enter the crowd explodes in appreciation and recognition. Marley has a slight rasp to his emotive vocal performance only adding to its emotional resonance. The band is already cinched tight with the rhythm section of the Barrett brothers cutting the trail and leading the group toward higher land for a greater view. ‘Burnin and Lootin’ follows after a brief pause and holds down a substantial groove through the collaboration of Aston Barrett’s bass, Junior Marvin and Al Anderson’s guitars in a trident pronged rendition of the central melody line. The cadence of the track is as thick and sweet and Guava jelly, driving and allowing for Marley and the ‘I Three’s vocals to embrace, retreat and collaborate to great heights. The track segues seamlessly into ‘Them Belly Full’ like ocean sand meeting shoreline. The tempo increases and the music roaches into a puff of smoke initiated by skunky Tyrone Downie keyboards and overdriven Junior Marvin guitar. Over the course of this tour and into Europe The Wailers morphed into a dance hall orchestra, with each of Marley’s melodies transforming into an expansive reggae sonic landscape. 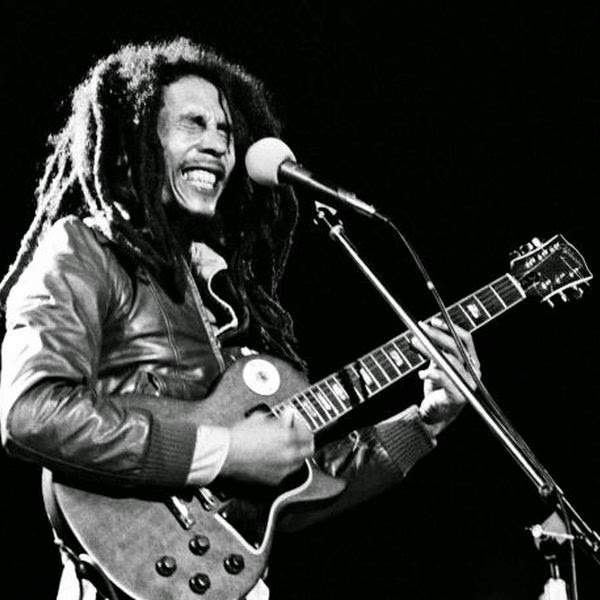 This musical freedom enabled Marley to strut and sway his way through his politically charged commentaries and joyful reiterations of faith and ganja with grace. ‘The Heathen’ from 1977’s Exodus follows next and acts as an invitation for those defeated followers of Jah to take back their confidence and their inner power to rise up and fight another day. Family Man’s plucky bass again pushes the performance, warming the assembled crowd and acting as the rumbling thunder to Marley’s lightening strike words. Vibrant island imagery, Rasta mythology, wisps of ganja smoke and Marley deep inside the music are featured in the accompanying footage. His complete absorption into the soul of the muse is stunning to witness, so tastefully documented. ‘I Shot the Sheriff’ follows with its usual nightly and impeccable performance. The version is imposing and pulls an enormous response from the crowd. At this point it was possibly Marley’s most popular track due to Clapton’s magnification of it through his cover version. Clapton’s reading cannot touch a version of this caliber…ever. Lighters light and matches combust as after the Sherriff has dropped to the ground and Marley invites the assembled friends in the crowd to ‘take it easy’. ‘Easy Skanking’, from the recently released Kaya, and the title track of this particular release makes a laid back appearance with thick joint between its fingers. A highlight performance and communal celebration that illustrates the essential elements that make Marley’s performances so special. ‘No Woman, No Cry’ now makes its nightly tour appearance in a version that while not as poignant as the well known version from 1975’s Live LP none the less does not fail to induce chills and inspire quiet contemplation. Marley makes this rendition as inspiring as any that preceded or that would follow, as his innate gift for sharing, inspiring and performing for any and all crowds as if it would be his final performance is expressed on this recording. The incendiary apex of the early show follows as Marley leads the band into a string of Wailers standards that individually ‘catch a fire’ and collaboratively provoke the crowd into ecstasy. ‘Lively up Yourself’ appears for the ashes of ‘No Woman, No Cry’, inviting the collected crowd to not ‘be no drag’ and to feel the diverse reggae riddims surging through their bodies and minds. Junior Marvin is the star here with pointed soloing that magnifies Marley’s vocals and off mic asides. This is an on stage party and the spirit is infectious as the crowd can be heard responding to the music, as well as Marley’s trance inducing dance. Quite possibly a highlight of the show, the visual footage that is included of this particular jam finds Marley immersed in the collective music making and communal vibe of the crowd. He faces Carlton Barrett at his drum kit and sways in creative fulfillment and absolute joy. The ‘I Three’s dance in a tight family circle, lost in the created sounds, existing for the musical moment, beautifully captured for posterity on this release. With barley a pause the band enters into an excitable and high tempo ‘Jammin’ that elicits the same sort of communal response as ‘Lively up Yourself’. Marley scats and raps as the Wailers churn a foaming musical current underneath him. Again, what footage is available here finds Marley eyes closed drenched in sweat, glowing with the energy of a worldly messenger visiting for only a delicate moment. The extended ‘Jammin’ ends the main segment of the set with Marley sharing a microphone with arms draped around the ‘I Three’s’ before leaving the stage, but soon to return with a militant and didactic display of three of his most influential songs and performances. After a double shot of the previous celebratory grooves Marley lights up a triad of heavy commentary, leaving the concert attendees with not only a dizzying display of musical spiritual awakening, but of messages to contemplate and possibly apply to their own existence. The crowd is ecstatic and begs for the band to return as documented on the recording and when Marley returns to the concert stage the performance ascends to the next level. ‘War/No More Trouble’ was a standard of Wailers sets throughout their career and this particular version is another dramatic and deadly serious melodic statement built on Emperor Haile Selassie I definitive foundational words. Marley’s vocals are chilling in their expressed emotional content, he voice quivering. 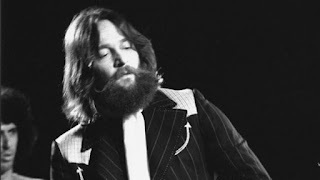 When the band climbs the ladder in ‘No More Trouble’ the music plays the band and the groove takes on its own form and life. This is the Wailers in their element and at their finest as they seamlessly enter ‘Get up Stand Up’. Marley dons guitar and short sleeved red t-shirt for this reading, thankfully captured by the enterprising fan. ‘Get Up Stand Up’ becomes freedom a sing a long, longing for life and freedom as well as a musical expression of hopefulness and strength. The multifarious drums and percussion accentuate Marley’s vocal patterns that answer both the instrumental details and the ‘I Three’s’ flawlessly placed Rasta interjections. 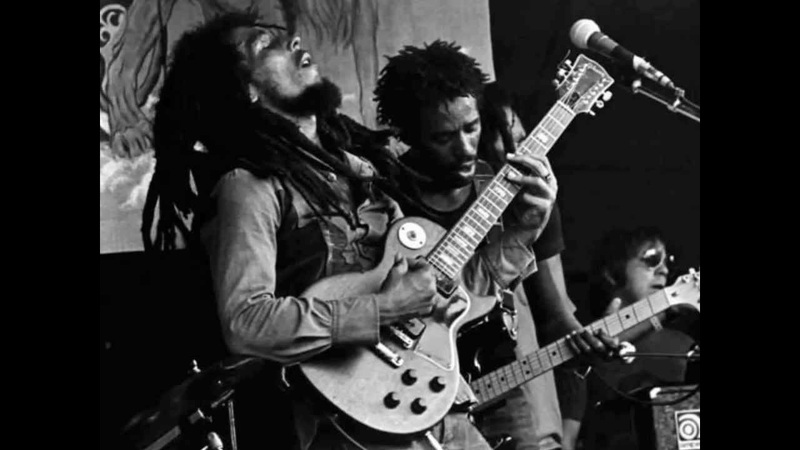 After a thorough exploration of ‘Get Up and Stand Up’ including the tribal call and response between Marley and audience, the song with a signal from Marley, suddenly becomes the show closing ‘Exodus’. ‘Exodus’ concludes the show in brilliant fashion with Marley screaming at the songs climax, ‘Jah!’, ‘Rastafari!’ repeatedly with such investment and soul that it’s impossible to not become moved from the developed musical magic. Bathed in red light, fist clenched, Marley quakes from an unknown force, he stands stoically with hand raised, dreads reverberating from his rocking head, opening his mouth and draining his reserves from such an exhausting and inspired performance. The show could not have ended in any other way. 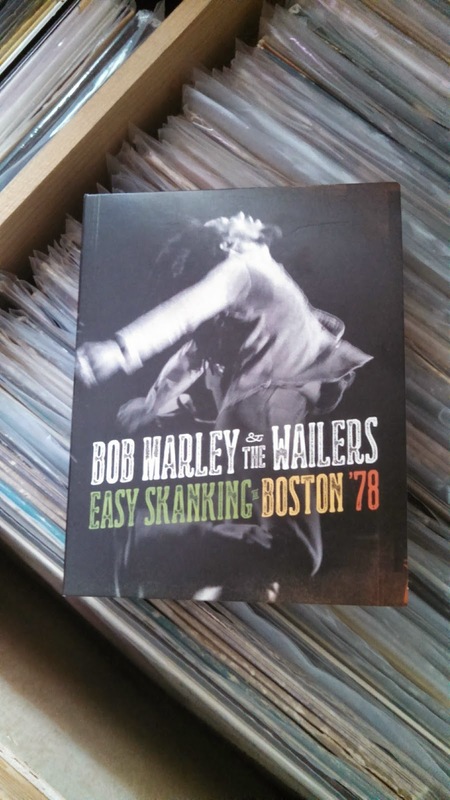 Bob Marley and the Wailers Easy Skanking, Boston 1978 is an amazing introductory release by the Marley family to celebrate his 70th Earth Strong day as well as a welcome addition to the ‘rock room’s’ Marley archives. The collection highlights a moving performance spotlighted by stunning soundboard quality and bonus accompanying video footage. Similar to the Hendrix archives, just when you think there cannot be much more Marley in the vaults, something like this comes out and rekindles the hope and excitement once again. A must have.